Tagged with The Thing, sexual selection, evolution, dinosaurs. May 2, 2013 by John Conway. The new home of the world-famous Tetrapod Zoology blog - Tet Zoo for short - now in its fourth iteration. Tet Zoo is devoted to discussion, research, discovery and speculation regarding THE TETRAPODS: the amphibians, reptiles, birds and mammals, and all of their extinct relatives. No fish, never fish. Ok, I also do fish now. Follow me on twitter @TetZoo and please help support my blogging, writing and research at patreon. 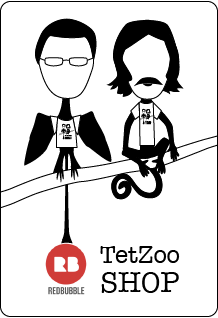 Tet Zoo merchandise is available at the redbubble shop. This site is also the home of the podcast, co-hosted with John Conway as the straight-man. John can be found on twitter @thejohnconway. A separate support stream for the podcast can be found here. If you like what we do, please consider providing support.